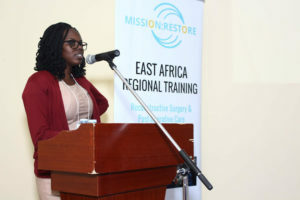 Every year, Mission: Restore makes an active effort to ensure that women surgeons are well-represented at our annual East Africa Regional Training (EART). We’re excited to announce that thanks to our new Women in Surgery Initiative, we had record-breaking numbers of women participants at the EART 2018! We wouldn’t have been able to do this without our partners. Thanks to our partnership with The College of East, Central, and Southern Africa(COSECSA) and their affiliate Women in Surgery Africa (WiSA), 20 surgeons from COSECSA participated in the 2018 EART. 13 surgeons from COSECSA and 7 surgeons from WiSA were nominated to attend the EART and 11 of these surgeons were women (over 50%)! 52 out of 103 total participants (nurses and surgeons) were women at the EART this year. That means over 50% of our total participants were women! 40% of our surgeon participants were women (27 female surgeons in total), a 108% increase from 2017. Therefore, it was only appropriate to have a certain spotlight on these incredible women making strides in a field in which they are severely under-represented. On Tuesday the 10th of July, after a day of lectures and workshops, we held a Women in Surgery Cocktail Hour at the poolside to allow for networking amongst fellow women surgeons and a platform to share experiences, challenges, and possible solutions to the specific barriers that women face in the surgical field. This event was supported by our partners, Women in Surgery Africa (WiSA), and sponsored by RealSelf. WiSA is a peer support group which assists female surgeons, trainees and medical students with an interest in surgery to actively seek out mentorship relationships. 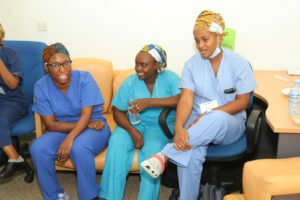 WiSA promotes, facilitates and enables women to take up leadership roles and positions in surgery. It does so by its innate ability to understand the needs of women in surgery and the challenges women surgeons and trainees face. WiSA aims to promote professional networking and encourage multi-center collaborations. WiSA acts as a forum for discussion of pertinent issues peculiar to and affecting its members. It addresses the unique challenges that women surgeons face such as: balancing family issues with the demands of a surgical career, including when to have children, pay and promotion equity issues; and the lack of women in academic leadership positions. The College of Surgeons of East, Central, and Southern Africa (COSECSA) is a nonprofit organization that provides and fosters medical education and training to surgeons in East, Central, and South Africa. COSECSA leads the training of surgeons in the Sub Saharan region. They currently operate in 12 countries in the Sub Saharan Region and are the second largest surgical training institute in the region. COSECSA works to increase the number of properly trained surgeons and medical officers and to advance the science and practice of surgery in the region. It promises to do this through promoting postgraduate research of surgery relevant to that region, organizing common training programs, and bringing together surgeons from around the region to have common workshops, lectures, and conferences.